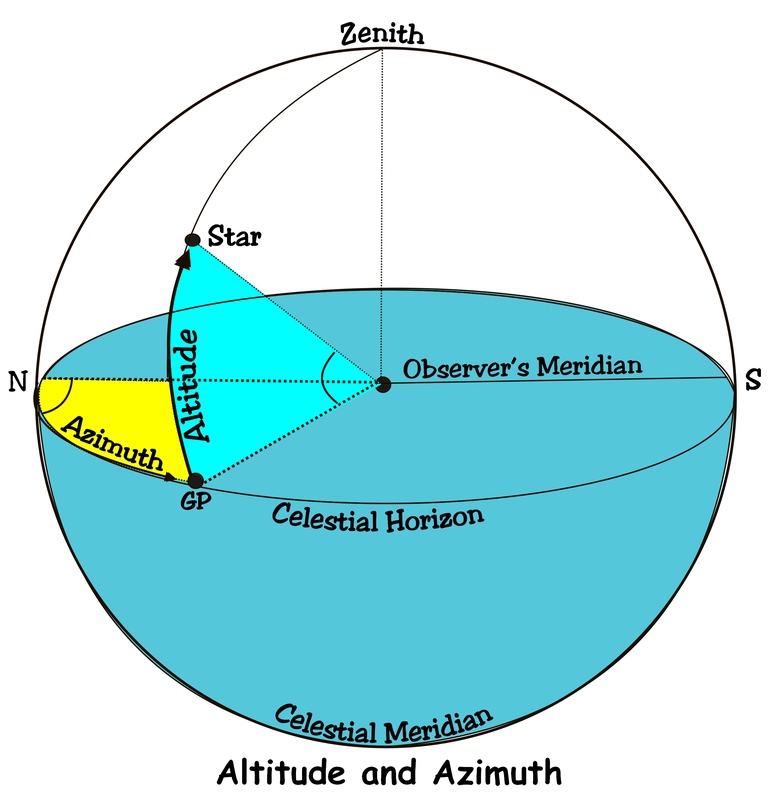 The Azimuth is similar to the bearing in that it is the angle between the observer’s meridian and the direction of the celestial body. However, whereas bearings are measured clockwise from north from 0o to 360o, azimuth is measured from 0o to 180o from either north or south. If the observer is in the northern hemisphere, the azimuth is measured from north and if in the southern hemisphere, it is measured from south. If for example, the bearing of a celestial body is 045o , in terms of azimuth it is either N45oE for an observer is in the northern hemisphere or S135oE for an observer in the southern hemisphere. The diagram below illustrates this. Altitude. The altitude of a celestial body is the angular distance between its position in the celestial sphere and the celestial horizon as measured at the observer’s position. Measuring the Altitude. To measure the altitude of a celestial body, we use a sextant. 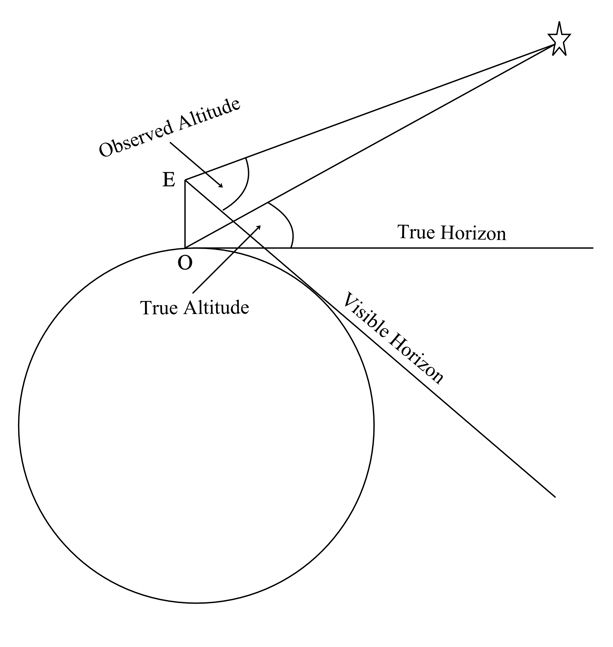 As shown in the diagram, the horizon is viewed directly through the sextant telescope and the celestial body is viewed via two mirrors. The upper mirror is attached to the index bar. The index bar is moved until it reflects an image of the celestial body into the lower mirror which is fixed. The position of the index bar is finely adjusted until the image of the celestial body appears to sit on the horizon. As the index bar is adjusted, it moves a pointer over a graduated scale and when the images are made to coincide, the angle indicated by the pointer is the altitude. The altitude measured by a sextant is referred to as the Sextant Altitude (Sext. Alt). Corrections. A number of corrections have to be made to the sextant altitude before we arrive at the True Altitude. Index Error. No matter how carefully a sextant is manufactured, there will usually be a very small error in its reading and this is known as index error. 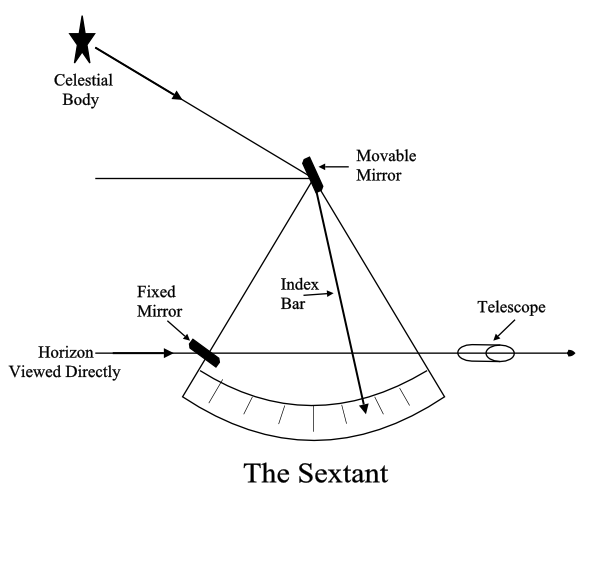 To calculate index error, view a single object through the sextant telescope and through the mirrors; move the index bar until the two images coincide and note the reading. If the reading is not zero, the actual reading is the index error. For example, if the reading is 2’ too high, it is said to be 2’ ‘on the arc’ and recorded as: Index Error – 2’.0. If the reading is 2’ too low, it is said to be 2’ ‘off the arc’ and recorded as +2’.0. Dip. A correction has to be made to allow for the height of the observer’s eye above the horizon; this is known as Dip. In this diagram, O is an observer’s position on the Earth’s surface and E is the position of his eye. We can see that, as the observer’s height of eye is raised above sea level, his visible horizon ‘dips’ below the true horizon and so the altitude measured at E becomes greater than that measured at O. Dip is the error caused by this difference and has to be subtracted from the reading. For example, if the height of eye is 4.6m. the correction will be 3’.8 (interpolate as necessary). 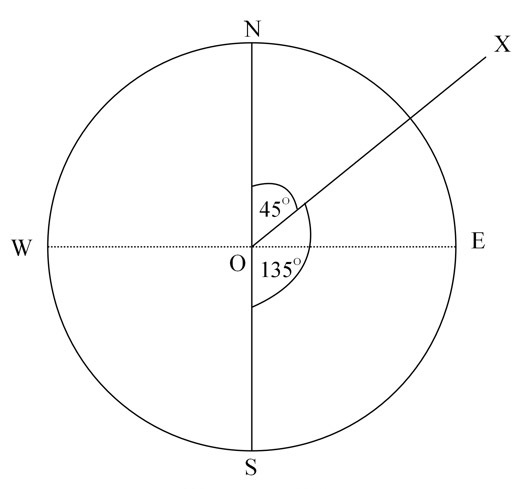 Apparent Altitude is found by applying the index error and dip to the sextant altitude. Semi Diameter. In practice, the altitude that we measure is that of the lower limb; however, what we really need is the altitude of the Sun’s centre and so,we must add a correction for the value of its semi-diameter. Parallax. The observer measures the altitude in relation to the visible horizon from his position on the Earth’s surface whereas the true altitude is measured from the Earth’s centre and so a correction called parallax must be added to allow for this. Additional correction for temperature and atmospheric pressure. This may be needed if the temperature and pressure are greatly different to the standard conditions which are assumed to be 10oC, 1010mb. True Altitude is found by applying the additional corrections for parallax, refraction, semi-diameter, temperature and atmospheric pressure which are incorporated in the altitude correction tables. 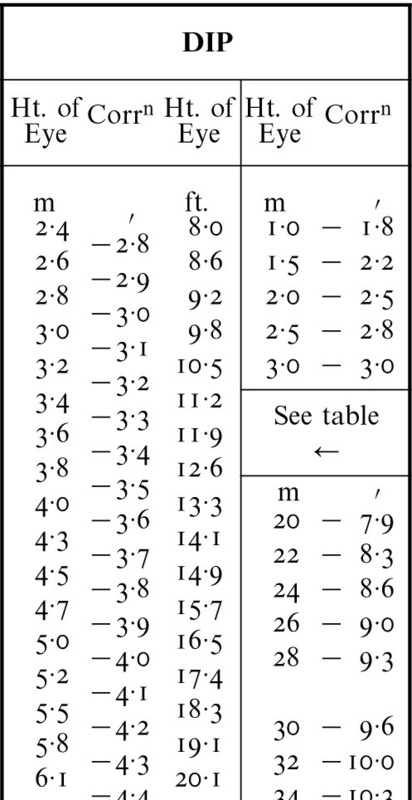 The Altitude correction tables will be explained in Unit 3 Part 2. (Note. This topic is covered in greater depth in the book ‘Astro Navigation Demystified‘). This entry was posted in astro navigation, Astro Navigation Demystified, Astro Navigation Topics, astronomy, celestial navigation and tagged astro navigation, astro navigation course, astronomy, celestial navigation, celestial navigation training, navigation. Bookmark the permalink.